Character. Cost: 3. STR: 1. Action: Kneel Septa Nysterica to choose an attacking character with STR 4 or lower. Stand that character and remove it from the challenge. Septa Nysterica had a homely pox-scarred face but seemed jolly. 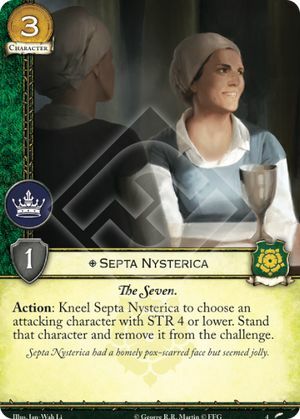 You can use Septa Nysterica to remove an already standing character from a challenge, same as with Highgarden.